These are the major international sprint results for these three skiers. Simi Hamilton was dropped down from the A to the B team. He has always been quite inconsistent, sometimes back in the 50s, sometimes advancing through several heats. Note that last season was generally pretty strong for him. His bad races were ones where he just missed qualifying, rather than being way off the pace. This year he was back to his old ways, and judging only from media reports in places like FasterSkier, he seems to have difficulty staying healthy. Or maybe just bad luck. Either way, my guess is that the USST basically has people on a two season leash. Last season was fairly promising for Simi, so he probably bought himself a bit of slack for one season. I’d be willing to bet, though, that if he has another year like this one, or worse, his spot will be in trouble. 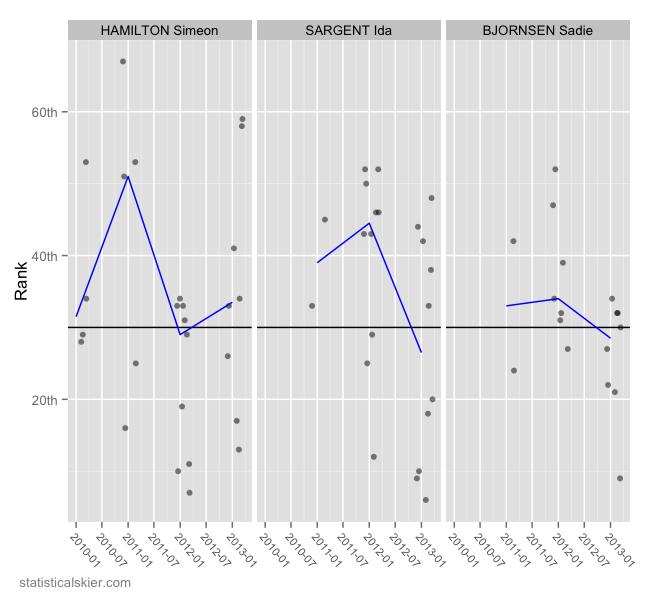 Sadie Bjornsen and Ida Sargent are kind of an interesting contrast. Sargent’s results are in two distinct groups: just outside of qualifying, or top 20. Bjornsen on the other hand had one excellent sprint result, and then was generally in the 20-35th zone the rest of the time. But both improved dramatically over last season. Posted by Joran on Wednesday, May 1, 2013, at 6:00 am. Filed under Analysis, Cross Country, World Cup. Tagged Sprint, us ski team, World Cup. Follow any responses to this post with its comments RSS feed. You can post a comment or trackback from your blog.